For many systems, the performance data is produced in volumes and at rates that require some sort of automated and intelligent filtering by which the mundane data can be removed from the interesting information. Once interesting information has been found, there are a variety of actions that may be appropriate. The Performance Metrics Inference Engine ( pmie ) is the tool within PCP that is designed for automated filtering and reasoning about performance. pmie evaluates a set of assertions against a time-series of performance metric values collected in real-time from PMCD on one or more hosts or from one or more PCP archives. For those assertions that are found to be true, pmie is able to print messages, activate alarms, write syslog entries and launch arbitrary programs. where the "alarm" action launches an information dialog with the specified message. Other pmie actions are discussed later in the Actions and parameter substitution of predicate context section. Note the shell keyword introduces an arbitrary action in which any program can be launched. Each pmie rule may be evaluated over a set of performance metric values. 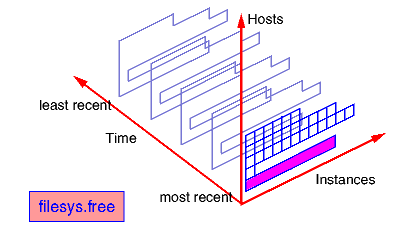 Conceptually these sets of values are constructed for a single performance metric by taking the cross product of observed values over the three dimensions of: hosts , instances and times . the local host if neither -h nor -a appears on the command line. 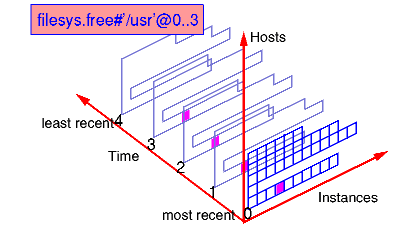 By default, a metric name represents the set of values formed by the cross product of the default host for pmie , all instances and the current time. If there is only one instance, then the set contains a singular value. One or more suffix of the form # instance (where instance is the external instance identifier) after a metric name restricts the set of values on the default host for pmie , to the nominated instances and the current time. If instance includes any special characters then it should be enclosed in single quotes. One or more suffix of the form : hostname after a metric name changes the set of values to include all instances on the nominated hosts, at the current time. A suffix of the form @ N..M after a metric name changes the set of values to be that formed by all instances on the default host for pmie , at the sample times N , N+1 , ... M back from the current time. And finally more than one type of suffix may be used to control enumeration in each of the three axis directions. The predicate some_inst expr is true if there is some instance of a metric that makes expr true. 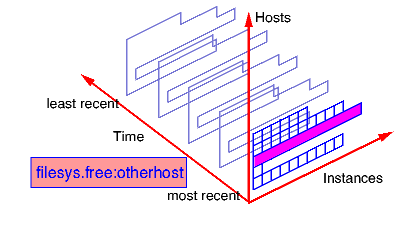 Existential quantification over hosts and consecutive samples is also supported by some_host expr and some_sample expr . The predicate all_inst expr is true if expr is true for every instance of a metric. 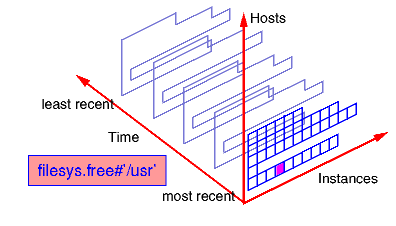 Universal quantification over hosts and consecutive samples is also supported by all_host expr and all_sample expr . Quantification predicates may be nested. The predicate N %_inst expr is true if expr is true for N percent of the instances of a metric. Percentile quantification over hosts and consecutive samples is also supported by N %_host expr and N %_sample expr . These predicates are discussed in depth in the pmie manual page. pmie expressions are very similar to the C programming language; especially with regard to arithmetic, relational and Boolean operators, and the use of parenthesis for grouping. The pmie language allows macro definition and textual substitution for common expressions and metric names. would have the value 1000 and the units of bytes/second . Within the arguments that follow the action keyword, parameter substitution may be used to incorporate some context from the predicate in the arguments to the actions. For example, when using some_host or some_inst in a predicate, it is most helpful to know "which hosts" or "which instances" made the condition true. In this exercise, we shall use pmie to investigate performance from a PCP archive. Yes, PCP archives from that long ago still work today! we can visually determine which disks and which controllers are active. This is easy, which is good. However, consider the situation where we have a large number of separate archives, possibly collected from different machines and with different disk configurations. We'd like to be able to quickly process these archives, and filter out the extraneous information, to focus on those times at which the disks were busy, how busy they were, etc. some disk has a high I/O rate (as defined above) and the system's 1 minute load average is greater than 5 (make use of the "1 minute" instance for the kernel.all.load metric). Use the pmie/babylon.perdisk archive extracted earlier to cross check your rules as you add each one. Make sure you sample the archive every 5 minutes ( -t 5min on the command line). You'll need to use existential quantification (the some_inst keyword) in all of the rules. 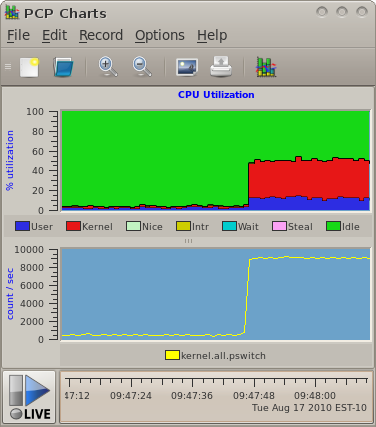 Notice there are three values corresponding to the 1, 5 and 15 minute load average. For pmie the metric kernel.all.load is a set of three values, one for each instance at each point of time. To choose one instance append the # qualifier to the name of the metric and the name of a particular instance, e.g. kernel.all.load #'1 minute' . The pmie(1) man page describes the pmie language in detail. You may find it helpful to use dkvis to visually predict when the rules should be triggered. Using the PCP Archive Time Control dialog, you can position the dkvis display at the time where pmie is reporting interesting activity. When all else fails, the solution is at pmie/answer.pmie . As a final exercise, investigate the effects of using different update intervals on the pmie command line (the -t option) with the initial configuration file and archive from the previous exercise. Why does the number of reported incidents decline as the rule evaluation interval increases? Enter the name disk.dev.total into the Metric Selection dialog. There should be 54 instances of the metric listed. Find the instance jag3d5 , select it, and press OK.
Use the PCP Archive Time Control dialog to change the Interval . By using smaller values of the update interval, can you deduce the sampling rate of the data in the PCP archive?